In the previous video we touched on some of the basic metric modulations using eighth notes, triplets and sixteenth notes for our sub divisions both originally and modulated. This time, we’re going to use the same subdivisions but we’ll be breaking the patterns up. For example, instead of playing every single note of the triplet, we may play every second one. This way, from eighth notes to triplets, we can use triplets to slow down instead of speed up. The first example is going to be just that. Take note that in the modulated version, our right hand is playing three over two on the cymbal, while between our kick and snare across the quarter note we’re playing three over four. 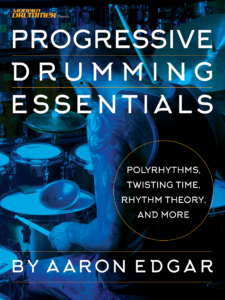 All in how you perceive it, those polyrhythms exist. As I mentioned in the video, you NEED to be feeling the original pulse. That quarter note. Once you can do that, it actually feels really cool how the implied pulse dances around the actual pulse. That syncopation is a big part of what I love about these illusions and bands like Meshuggah and Tool. The second example is the exact same illusion only embellished with some extra bass drums. This time, there are bass drums that don’t line up with our hands. They’ll slip in between the cracks of our polyrhythm in the modulated bar. A very cool feel if you’re perceiving it correctly! Both examples three and four again are the same kind of illusion but applied differently. In number three we’re using a pattern that in it’s original form repeats every second quarter note which allows a shorter illusion form. Depending on how we want to phrase coming out of it, illusions like this make it a little easier to allow them to resolve naturally since it’s much shorter to have beat one line up again. Example number five is the same example from the Metric Modulation Vs. Implied Metric Modulation video. It’s played a little slower here for you guys to hear. As explained previously, we’re using a dotted eighth (3/16) spacing for our note placement in the modulated groove. Nasty gong drum double bass grooves, anyone? I think so! You don’t need gong drums to do this either. You can use floor toms, or even just one floor tom if you don’t want to switch sides between the modulated and non modulated grooves. These can entirely be done on a single sound source. Personally, I enjoy changing the “kit” with the modulation. It helps drive it home a little more. So in example six, we’re not going to embellish at all. We’re just going to play eighth notes with our left hand (which ever hand you want, I chose left for the sixteenths) and simulate kick, hats, snare, hats. Almost a disco kind of feel with one limb with our double bass sixteenth notes underneath. When we modulate, physically our pattern is identical (although I chose to phrase it with my other arm on the other side of my kit) applied to an eighth note triplet subdivision which implies slowing down. The final example we of course add in all the off beat notes with the hand that isn’t simulating the groove. Just sixteenth note ghosting on the snare is sufficient. You can do whatever you want to fill it up. I added doubles here and there to spice it up. That about wraps it up for this episode on modulation. I hope you take some of these phrasings and plunk your own grooves into them. Only then, when you’re making them your own will you truly fall in love with how these feel. Remember I spoke about that syncopation between your modulated pulse and the actual pulse? That feeling becomes addicting! Get on it! what cymbal was the ding at 0:24? what﻿ cymbal was the ding at 0:24? what cymbal was the ding at﻿ 0:24? what cymbal﻿ was the ding at 0:24? what cymbal was﻿ the ding at 0:24? what cymbal was the ding﻿ at 0:24? what cymbal was the﻿ ding at 0:24? [..YouTube..] what cymbal was the ding at 0:24? is a gong drum just like a big single-headed floortom? is﻿ a gong drum just like a big single-headed floortom? is a gong drum just﻿ like a big single-headed floortom? is a gong drum just like a big single-headed﻿ floortom? is a gong drum just like a﻿ big single-headed floortom? is a﻿ gong drum just like a big single-headed floortom? is a gong drum﻿ just like a big single-headed floortom? is a gong drum just like﻿ a big single-headed floortom? is a gong﻿ drum just like a big single-headed floortom? is a gong drum just like a big﻿ single-headed floortom? [..YouTube..] is a gong drum just like a big single-headed floortom? [..YouTube..] Do you like your hammerax cymbals? Would you recommend them over say like.. Paiste? I play hard rock and metal and these cymbals caught my eye, but ive only heard them on youtube videos because my drumshop doesnt have them. If you could get back to me that would be great, thanks ! Do you like your hammerax cymbals? Would you recommend them over say like.. Paiste? I play hard rock and metal and these cymbals caught my eye, but ive only heard them on youtube videos because my drumshop doesnt have them. If you could get back to me that would be great, thanks ! [..YouTube..] Honestly, as with any gear it’s entirely personal preference. There isn’t one that’s better than another in the grand scheme of things, just what’s better for an individual player. Paiste is the polar opposite of Hammerax where they focus on bright sounds and extreme consistency. Hammerax focusses on dark (and wildly unique) sounds where every single cymbal is an individual piece of art that will differ from the next one greatly. Paiste, their cymbals all sound identical. It’s all what you want! Honestly, as with any gear it’s entirely personal preference. There isn’t one that’s better than another in the grand scheme of things, just what’s better for an individual player. Paiste is the polar opposite of Hammerax where they focus on bright sounds and extreme consistency. Hammerax focusses on dark (and wildly unique) sounds where every single cymbal is an individual piece of art that will differ from the next one greatly. Paiste, their cymbals all sound identical. It’s all what you want! That was an awesome explanation on cymbals! wowee! gong drum sounds great!